New Tecumseth - PETER A. BARBATI *Sales Rep.
For a detailed Home Evaluation, click on the "Home Evaluation" link above. keeping your costs down through efficiency. RECEIVE FULL SERVICE (on the Toronto MLS Board™) and all boards via the Connect™ service. For a complete list of features and benefits, please contact me for your CMA (Comparative Market Analysis) and estimated savings when compared to similar services offered at a higher rate. Start the year off right. Our FULL-SERVICE rate includes everything you need to sell your home efficiently and for the highest market dollar. You will receive a complete and accurate Comparative Market Value analysis (CMV) to ensure your home is in the proper market range to ensure an efficient sale and obtain the highest market value possible. You will receive FULL MARKET exposure on the Multiple Listing Service serving your area (in New Tecumseth, the Toronto Real Estate Board® and the public site plus exposure on our company site www.firstchoicerealty.ca and my personal site at www.yourspecialhome.com. You will receive complete service and attention from listing to closing with coordination of all documents to co-operating Brokerages and Solicitors. Contact me for an accurate Comparative Market Analysis and let's start your transaction off right! Available for property (homes) listings. Not applicable to sales of land lots, commercial properties or rent/lease transactions. Subject to change without notice. Promotion can be withdrawn without notice. 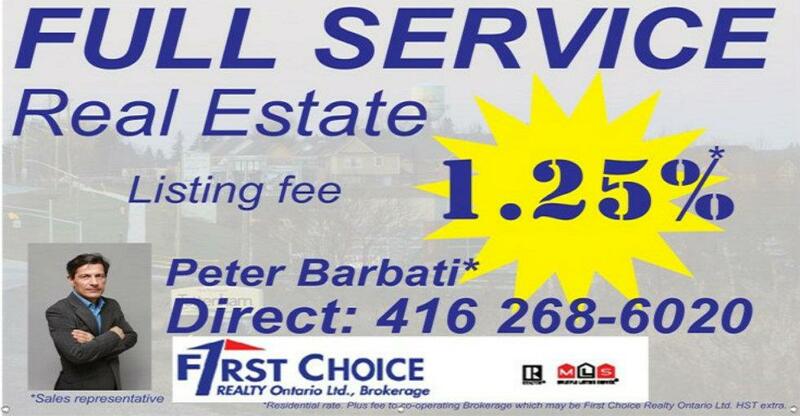 ©2002-2019 FIRST CHOICE REALTY ONTARIO ltd.